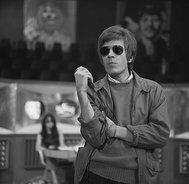 We awoke to the news that Scott Walker has died, and music is poorer without him. Scott shot to fame as part of the Walker Brothers, a hugely successful act which made him a pop star, and an act he walked away from to create a series of legendary solo albums which defined a whole movement. But legal wrangles with his label and a series of personal struggles affected the quality of his work, and Scott continued to walk away, moving into a career of experimentation that was true. While he spent large parts of his life out of the limelight, he would always pop out with something unique, and once he returned from a time away to produce a Pulp album. Below you will find The Seventh Seal, Scott’s retelling of the 1957 movie of the same name in just under five minutes. Yes, that was Scott. The whole of Scott 4 should be your starting point if you’ve not heard him before.